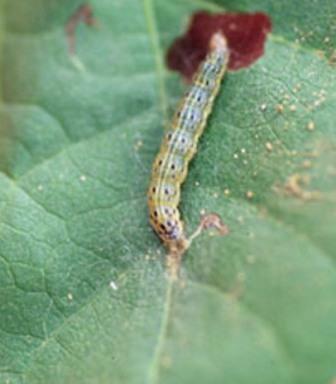 Region: This Caterpillar is found throughout North America, but growers in the Midwest and Southwest are particularly bothered by them. Life cycle: This insect produces two to four generations each year. Overwintering is done by the pupae within the soil. Physical Description: This 3/4 inch long caterpillar is light green with a light stripe and small dark green spots. It has several hairs on each segment and hides within a silken tube on the ground. The adult moth is brownish yellow with gray and brown markings, and a wingspan of about 3/4 of an inch. The eggs are laid in groups on the leaves of the host plants. Feeding characteristics: This pest attacks bean, beat, corn, pea and strawberry plants by spinning light webs and feeding from within. They drop to the ground when they are disturbed. Controls: Cut off and destroy webbed branches. handpick feeding webworms, and crush those hiding in their silken tubes by stepping on them. Various Trichogramma Wasps and the Spined Soldier Beetle are natural predators and can aid in controlling this pest. If damage is intolerable and handpicking is too labor intensive, you can apply Bacillus thuringiensis or pyrethrum.